The supermassive black hole at the core of the spiral galaxy NGC 4151 has created an odd structure — seen here in a composite photo combining images taken by several different telescopes — that some astronomers have dubbed "The Eye of Sauron." The enormous black holes that lurk at the hearts of all galaxies are significantly bigger than astronomers had imagined, a new study suggests. Researchers have used a new method to measure the distance to the active spiral galaxy NGC 4151 — whose core is dubbed the "Eye of Sauron" because of its resemblance to the structure in the "Lord of the Rings" films — with unprecedented precision. This calculation enabled them to determine the mass of NGC 4151's central black hole more accurately — and the results were surprising. Supermassive black holes can contain as much mass as hundreds of millions, or even several billion, suns. Previous estimates of the distance to NGC 4151's central black hole relied on measurements of redshift — how wavelengths of light are lengthened by an object's motion away from Earth-based observers. This technique yielded imprecise results, with estimates ranging from 13 million to 95 million light-years, Watson said. 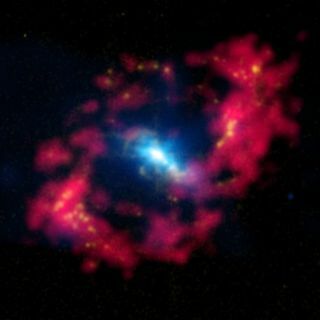 When gas falls toward the black hole at the center of the galaxy NGC 4151, the gas heats up and emits ultraviolet radiation, which in turn heats the ring-shaped dust cloud orbiting the black hole at a distance. This causes the dust to emit infrared radiation. The time difference between the light from the black hole and the light from the dust cloud is 30 days. So the study team, led by Sebastian Hönig of the University of Southampton in England (who was working at NBI while performing the research), tried out a different method: geometry. As NGC 4151's black hole draws in nearby gas, the material gets heated up and releases ultraviolet (UV) radiation. This radiation, in turn, heats up a ring of dust that orbits the black hole, causing the dust to give off infrared radiation. Observations by Earth-based telescopes have revealed that the time delay between the UV and infrared emission is 30 days. Because the speed of light is known, calculating the distance between the black hole and the dust ring is a relatively straightforward matter. The researchers used the twin Keck telescopes in Hawaii to measure the angle the dust ring makes in the sky — just 12 millionths of a degree. They combined the light collected by both telescopes, using a technique called interferometry. The method resulted in a resolution about 100 times greater than that achieved by NASA's Hubble Space Telescope, researchers said. The team could then calculate the distance to the Eye of Sauron using geometry. The distance from the black hole to the dust ring forms the base of an isosceles triangle, whose twin long legs are the distance from Earth to either side of the ring; with the angle of the sharp point of the triangle known, the legs' distance can be computed. The team calculated the distance to NGC 4151 to be 62 million light-years, with an uncertainty of just 13.5 percent or so. This improved precision will help researchers estimate the true heft of supermassive black holes, Watson said. ‪"The calculations of the mass (weight) of the supermassive black holes at the heart of galaxies depends on two main factors: the rotational speed of the stars in the galaxy and how far it is from the black hole to the stars," he said. "The rotational speed can be observed, and the distance from the black hole out to the rotating disc of stars can now be calculated precisely using the new method." Initial indications suggest that supermassive black hole masses have been underestimated by perhaps 40 percent. Researchers hope to extend their measurements to other active galaxies; the technique could eventually help astronomers better understand the rate at which the universe is expanding, study team members said. The new study was published online today (Nov. 26) in the journal Nature.